HR data was never naturally a good fit for databases and that will be even more true in the future. The new HR data warehouse is the smart solution to manage cost and risk while continually adding value to support HR as a strategic business partner. This approach answers many of the questions currently plaguing HR and IT landscapes now and well into the future. How can I achieve fast ROI across my global organization with reporting and analytics? Many organizations made the business case for multi-million ERP implementations to simply gain consolidated global headcount reporting. Unfortunately ROI was much harder to achieve than anticipated in many cases and now a simple global headcount report alone is not enough to serve the strategic business needs. Global HR data model links data across HR systems and geographies. With a global HR Data warehouse platform, you can achieve advanced reporting and analytics benefits for a fraction of the cost of reimplementation of landscapes which continually shift over time as it is. Implementation time is a fraction of that of ERP systems and because there are no internal staff or IT infrastructure requirements, organizations can achieve ROI immediately. How can I avoid losing reporting functionality across HR systems? The fragmentation and specialization plus best of breed SaaS application adoption has organizations losing reporting capabilities across functions of the Human Resources and Payroll domains. Consolidate data from fragmented “best-of-breed” enterprise software throughout your organization. As SaaS options in the HR technology landscape come and go through growth and acquisitions, organizations need a consolidated platform for reporting and analytics. Although many of these transactional systems offer analytics and reporting functionality, without data all in one centralized, global application organizations cannot slice and dice strategic data across all Human Resources functions. In addition to providing self service reporting and analytics across HR and Payroll functions, this also enables centralized security and allows data retention compliance policies to be monitored and enforced in one place. How can I decommission old legacy systems and retain data history for compliance? HR data history is often required for a minimum of 7 years for compliance purposes which means keeping “dead” legacy systems up and running. A data warehouse allows IT the flexibility to quickly trim HR systems from the landscape to cut costs. As technology changes over time and organizations look to constantly better serve their strategic objectives, systems landscapes also naturally shift. HRIS systems typically have a lifespan of 7-10 years and that could be shortening with lower TCO (Total Cost of Ownership) and lower exit barriers which SaaS applications promise to deliver on. As organizations migrate from one HR system to the next, data history is almost always left in the outgoing legacy systems for audit and compliance purposes. Transactional HR systems require mapping to configuration which does not exist historically. The Fuse Analytics data warehouse leverages system agnostic HR-XML based data models which can be mapped to any HR system while also storing native table values side by side. This permits a consistent and continuous 10+ year view of data from multiple systems even while organizational configuration and structures shift over time. 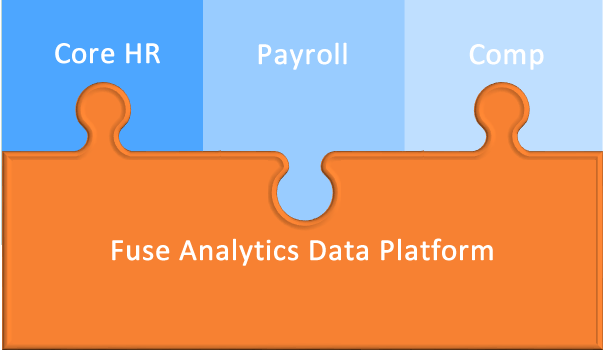 Some of the benefits above might be achieved by building an in-house HR data warehouse. 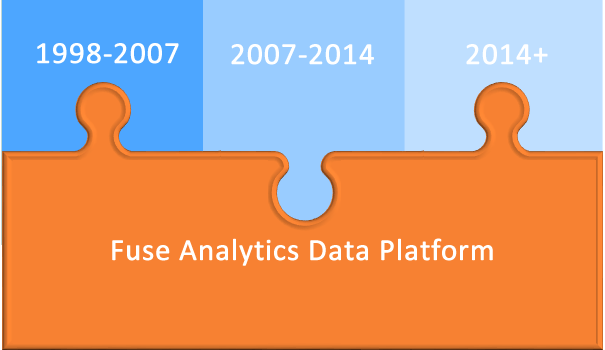 However, the Fuse Analytics Saas HR platform offers many advantages over the traditional data warehouse implementation. Robust application functionality, not just a reporting platform: HR-centric, extensive report distribution options, advanced integration, collaboration, etc. Specialized software vendor budgets are generally bigger than many single HR departments. An organization with a fragmented network of net payroll providers and needs to globalize reporting without re-engineering and re-negotiating the entire Payroll vendor network worldwide. HR is moving toward a global Service Center model. Payroll is outsourced in some countries to various vendors and run in-house for others. However, some local payroll providers provide a more cost effective service than could be achieved by implementation of a new global platform for payroll, but the organization wants one single point of access for all employees for all HR and Payroll related functions. Achieving global payroll reporting out of a single platform can be very costly and in many cases ineffective. Small country payroll solution: provide a cost effective reporting platform for organizations with headcount spread thinly across countries (less than 100-200 active employees). 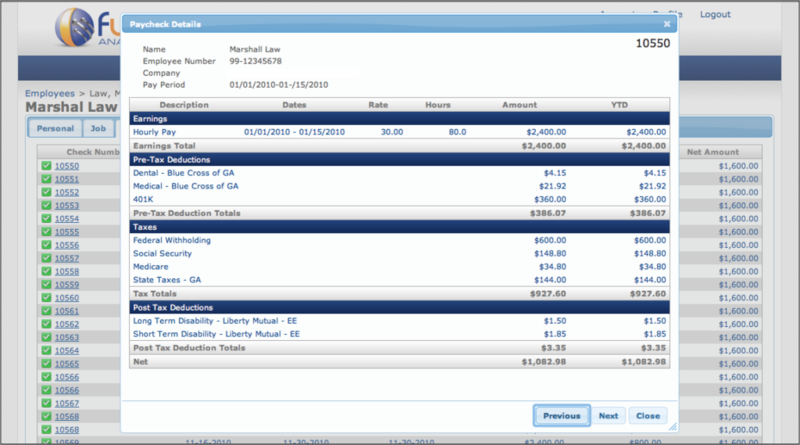 Consolidated employee pay portal: store payroll detail and PDF stubs for employee access in a single portal view regardless of net payroll platform. An organization looking to clean up their HRIS landscape and decommission legacy ERP or ASP systems locally or globally by archiving for compliance and audit needs. IT wants to turn off old systems and databases to streamline the IT landscape and cut costs. They suggest archiving the old legacy system to tape. However, HR wants real time access to historical data in the event of audits for compliance, not an SLA with the IT department requiring days or weeks turnaround for data retrieval. Live archive: Never lose access to your archived data and documents for compliance audit. Retain data online for retrieval and reporting any time you need it and as far back in time as you need it. 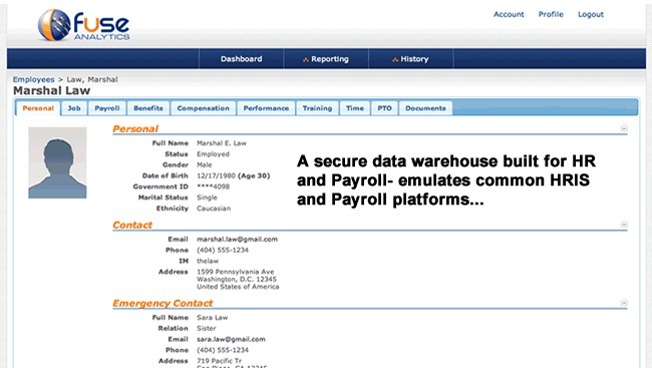 Fast browsing and reporting: Easy web-based interface emulates typical HR transactional systems allowing HR users to intuitively search and browse employee record history. An organization in need of a global HR analytics data model and data warehouse Platform-as-a-Service. A global services firm wants to provide HR with Analytics across the global organization from a single global PeopleSoft system without spending millions on an Analytics platform and the required infrastructure. Intuitive analytics: browser-based platform makes exploring your HR data and analytics as easy as surfing the web. Fast ROI: Leverage out of the box HR best practices analytics using internal company data and external competitive data from around the web. 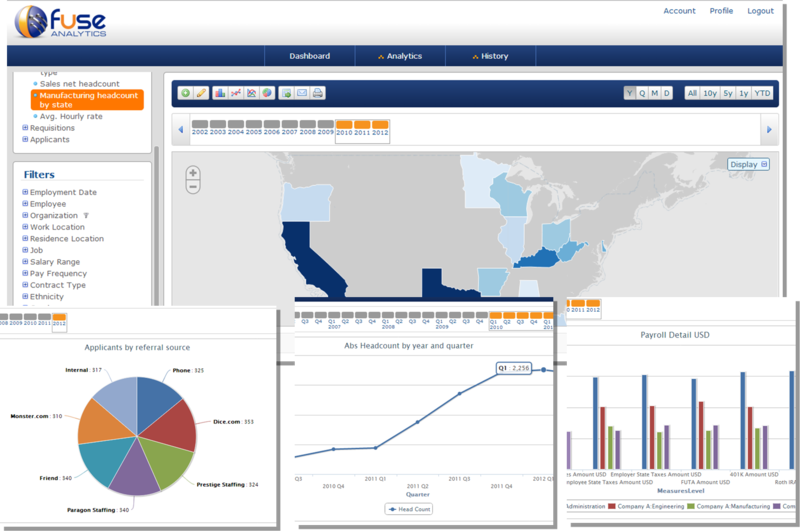 Global HR reporting and analytics: provides a comprehensive baseline HR data model for analytics on data globally with multi-language reporting capability for your global HR organization. What if we have already invested in a corporate business intelligence platform (SAP BI, Business Objects, Oracle OBIEE)? No problem. On-premise installations of the Fuse Analytics database can be integrated with these products as well. 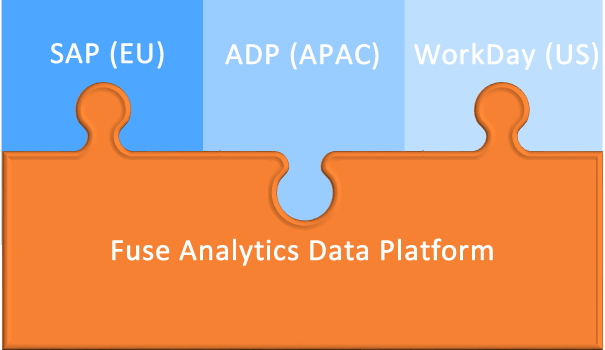 None of these platforms are able to provide a usable baseline HR global data model out of the box. Each provides a customizable catch-all reporting platform which often results in redundant development and very few re-usable components. In addition, the biggest user complaint of these ERP-style packages is lack of usability which is a hindrance to adoption by the enterprise wide group. In HR, usability is critical. Fuse can deliver HR reporting for many organizations at a fraction of the cost of other platforms and it does not require a full time staff of specialists to maintain. It is not just a flexible reporting platform but a full HR Analytics application that provides a global data structure, communications, compliance tools, and intuitive web-based interface not found in many of the legacy ERP BI platforms. Protection of PII (Personally Identifiable Information) and HR-centric security roles. HR employee and company documents (tax forms, garnishments, job specifications, etc.) linked to employee and company data records in a single portal. Legal limits on data and document retention policies can be easily enforced without compromising data and reporting. Leverages not only internal HRIS data, but adds external data (salary surveys, Maps APIs, benchmarking, etc.) from many sources to deliver HR-based analytics functionality which would normally be cost-prohibitive to develop in-house for HR. Full technology stack offers tools beyond SQL, NoSQL and in-memory technology for all data types: structured, semi-structured, unstructured + document and file management. Perfect. Tableau users can connect to the Fuse data repositories for ad-hoc data visualizations. However, in-memory reporting is not persistent and does not store data. The data models are built on the fly and can be different per user. Fuse serves as a globalized, persistent data store for every kind of people-centric enterprise data. 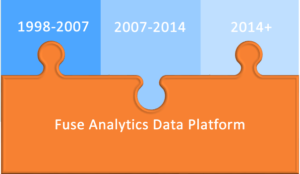 The combination of in-memory reporting with the Fuse platform offers a full stack of HR business intelligence solutions from data acquisition, to transformation (ETL), to visualization. This provides all the tools HR users need to easily combine data from all geographies, all systems, over time for a transformational view of your global workforce data.